Morels are, in my opinion, the best mushroom to pair with a red meat like venison, although porcini are pretty damn good, too. Morels just smell so… woodsy. That aroma, mixed with the dense richness of medium-rare venison, comes together to make the Cadillac of game dishes, at least to me. I’d serve this to even the most jaded or discerning palate. 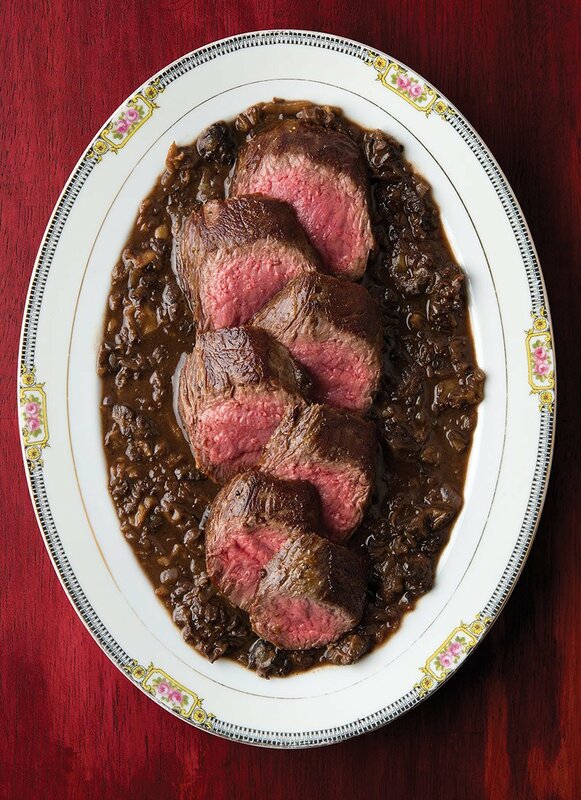 Venison with morel sauce is simple, but not cheap. 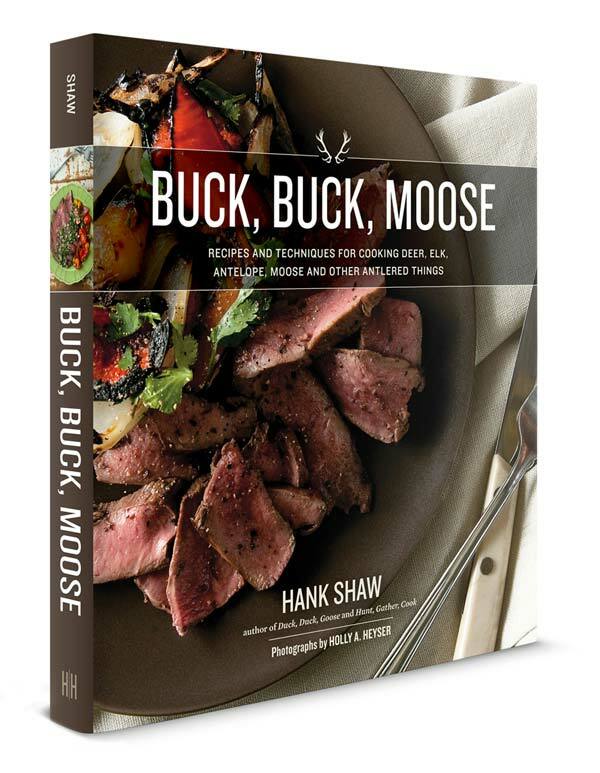 It’s a perfect date-night dish and is a great way to turn someone who might be squeamish about either venison or wild mushrooms. 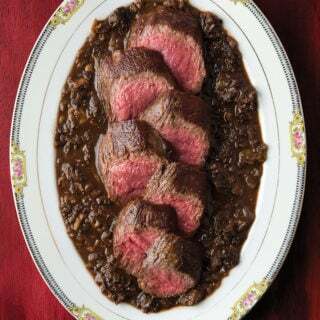 I always use either the tenderloin or the backstrap of venison for this recipe; I find the leg steaks too tough for such a special dish. It also can be done with filet mignon if you cannot find venison or antelope medallions, but it needs to be this kind of cut. You could use pork or wild boar loin, too, but be sure to cook it to medium, not medium-rare. A blush of pink is what you’re looking for if you use boar or pork. As for the morels, don’t skimp. Use even more than this recipe calls for if you have them. They cook down a lot and their flavor is really what makes this dish. It’s one of my favorite recipes for springtime! Morel mushrooms and venison, antelope, bison, or even the common steak, are a marriage far more successful than most pairings between mushrooms and meat, which can often compete with one another. This dish is simple, deep and delicious. But don’t skimp on the morels, or the quality of any ingredient: You will notice. You can sometimes find dried morels in supermarkets, or farmer's markets. You could also substitute shiitake mushrooms. In a small saucepan, reduce the stock and the water you soaked the morels in over high heat until you are left with about 1/2 cup of liquid. Turn off the heat and set aside. Obviously skip this step if using fresh morels, and do not include the demi-glace if using. Take the venison out of the fridge and salt it liberally. Let it rest at room temperature for 20-30 minutes. Heat a pan over high heat for 2 minutes. Turn the heat down to medium-high and place the fresh morels down on the pan to heat. They will release their water quickly. Let this simmer until the water is almost all gone, then add 3 tablespoons of butter and shallot. saute for 3-4 minutes, stirring often. Remove and set aside. If you are using dried morels, you do not need to dry-cook them first. Either wipe the pan down or use another one. Heat it over high heat for a minute or two and add the grapeseed oil. Heat this for 1 minute. Pat the venison dry with a paper towel and place it in the pan. Sear it for 3-4 minutes on one side, then flip. Let it cook through to your taste on the other side without flipping again. Look for about another 1-3 minutes, but I use the finger test for doneness. Remove meat from pan and set aside under foil to rest. Add the remaining tablespoon of butter and let it melt over medium heat. Add the flour and stir to combine to make a roux. Cook this for 2 minutes. Add the port wine and stir to combine. It will thicken immediately, and if it turns to a paste add the morel water-stock mix you reduced in step one. If it does not turn into a paste, let the port boil a minute, then add the stock or demi-glace. Add the morels. Once the morels are heated through, lay down a pool of the sauce on the plates, then top with venison. Arrange the rehydrated morels around the meat, and top each steak with a half of a fresh morel. Grind black pepper over all and serve at once. I did this tonight. With red wine instead of port, and avocado oil instead of grapeseed. Also I used Salt Lick dry rub instead of black pepper. But WOW! Such flavor. My non-game fan wife loved it. Pro tip – soak the backstraps in milk overnight to remove any “gamey” flavor. That also makes it easier to remove all the silverskin. Excellent recipe! My new go to favourite for backstrap!